The rich and complex flavors of classic Indian dishes like Lamb Biryani, Palak Paneer, and chicken in a creamy tomato-butter sauce can take hours to develop through such techniques as extended braising and low simmering. 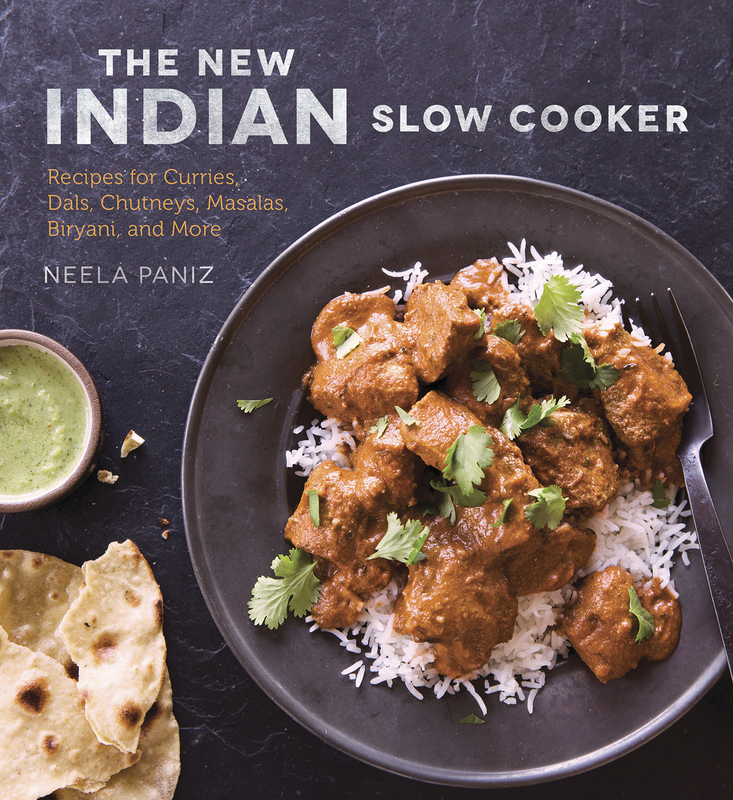 In The New Indian Slow Cooker , veteran cooking teacher and chef Neela Paniz revolutionizes the long, slow approach to making Indian cuisine by rethinking its traditional recipes for the slow cooker. Reprinted with permission from The New Indian Slow Cooker by Neela Paniz, © 2014. Published by Ten Speed Press, a division of Penguin Random House, Inc. Photography © 2014 by Eva Kolenko. 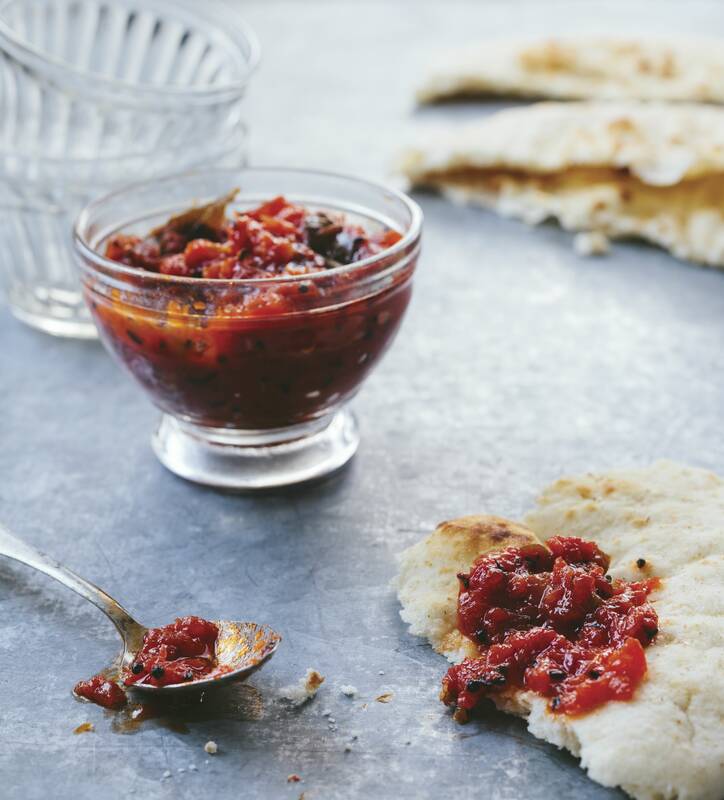 One of the more popular chutneys we served at both the Bombay Café and Neela’s was this sweet tomato chutney. Its uses are many—it can be a relish, a sandwich spread, and an accompaniment to many Indian snacks. Or pair it with some of the hearty meat dishes in this book, such as Lamb with Spinach (saag gosht). Using a smaller 3 1⁄2-quart slow cooker is better for this recipe, but if you wish to double the quantity, a larger capacity slow cooker would be best. Before prepping the ingredients, turn the slow cooker on to the high setting for 15 minutes, until the insert is warmed through. Drain the tomatoes and coarsely chop them in a food processor. Add the chopped tomatoes, sugar, and jaggery to the slow cooker. Heat the oil in a small saucepan on high heat, with a lid handy. Tilt the pan to form a pool and carefully add the panch puran, kari leaves, and chiles to the oil; cover immediately to avoid splattering. As soon as they stop sputtering, transfer oil and spices to the slow cooker. Mix well, cover, and cook on low for two hours. Transfer the chutney to a mixing bowl to cool to room temperature. Stir in the vinegar and refrigerate until ready to serve. If you intend to store the chutney for later use, transfer to a sterilized jar, close tightly, and refrigerate for up to 10 days; be careful to avoid contamination by using a clean dry spoon each time you use any and do not return any unused chutney from the dinner table back into a sterilized jar. On my many visits to India, I have sat with various members of the family gathering ideas for creating different curries. My mother’s aunt told me that it was most important to add rum and saffron to a Sindhi-style meat curry, sel gosht, in which meat is cooked for long hours with aromatics and whole and ground spices until the pieces melt in the mouth. 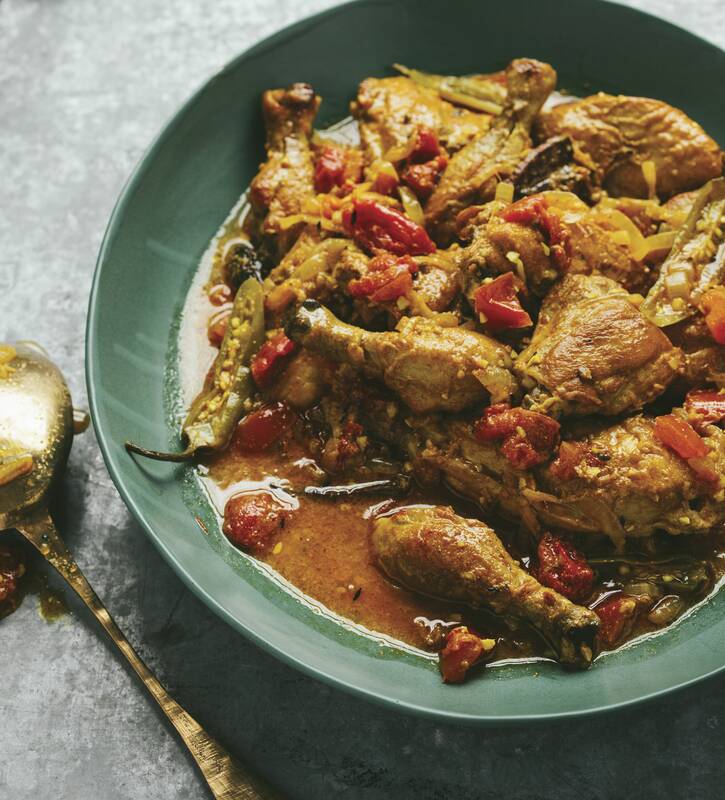 I have taken liberties with this recipe to create a flavorful but lighter stew using Cornish hens and the slow cooker. This recipe is best in a 6-quart slow cooker. It can also be doubled for a larger number of guests or cut in half for just two or three people. If your cooker is oval in shape, it is best to place the Cornish hen pieces in a single layer after mixing with the spice mix. Otherwise, try to spread the pieces throughout the cooker bowl with enough spice mix between the pieces. In a skillet, heat the oil over high heat, with a lid handy. Tilt the pan to pool the oil and carefully add the cumin seeds; cover immediately to avoid splattering. When the sputtering subsides, add the sliced onions and brown for about 10 minutes over medium-high heat. Add the garlic, ginger, cassia, cardamom, cloves, and bay leaf to the browned onions and sauté for 1 minute before transferring to the slow cooker. Set the skillet aside. In the bowl of the cooker, combine the sautéed onions with the ground coriander and cumin, turmeric, red chile, fresh and canned tomatoes, tomato juice, yogurt, salt, serrano chiles, rum, and saffron. Mix well. Use the saved skillet to sear the hen pieces in batches; place them in the slow cooker and turn them in the spice mix. Arrange them as uniformly as possible. Turn the cooker to low, cover, and cook for 31 ⁄2 hours. Turn the cooker to warm, and remove the cassia pieces, cardamom, cloves, and bay leaf. Stir in the cilantro when ready to serve. Some recipes will call for roasting whole spices and then grinding them. The simplest and most efficient way to do this is to use a dry skillet. Place the whole spices in the skillet and roast them over medium-high heat, shaking continuously to get an even browning. As the spices roast, they will send forth an intense aroma and, depending on the spices you are roasting, they will deepen in color—especially cumin and coriander seeds. Whole red chiles will tend to burn if you’re not careful; constant shaking of the skillet helps them roast evenly. As soon as they’re roasted, transfer the spices from the hot skillet to a flat plate, spread them out to cool, and set aside. To grind spices, use either a mortar and pestle (for a small amount) or a spice grinder—usually a coffee grinder that is dedicated to grinding spices (never coffee – here are coffee grinder reviews to help you specify). Always store unused ground spices in an airtight jar or container (see page 9) and use them as soon as you can. Many recipes in Indian cooking call for adding whole spices, such as cassia sticks, whole cloves, and bay leaves to the dish while it’s cooking. These are for flavor but not consumption: remove them before serving the dish. Indian households make yogurt each night for the next day, culturing fresh milk with a bit of that day’s yogurt. It’s easy, and worth it: the taste of homemade yogurt is just that much better. A few helpful hints: the milk should feel warmer than your body temperature—if it is has cooled too much, the culture will not develop; and do not use too much starter or let it set too long as it will be too tart. I prefer to use whole milk, though you can use 2 percent fat milk. Use a good brand of plain yogurt for a starter and thereafter use the yogurt you have cultured to start the process. Over high heat, bring the milk to a full boil without stirring it; beware of its boiling over. Remove the saucepan from the heat and allow the milk to cool in it. When it is still warm to the touch, about 95° to 100°F, pour the milk into a ceramic or glass bowl and stir the yogurt into it. Cover the bowl with a lid or plastic wrap, then wrap it with a few kitchen towels to keep the heat and set it in a dark, warm place overnight or for at least 8 hours. You will know that the yogurt has cultured when a thin film of whey appears on the top. Refrigerate for at least 4 to 5 hours to set completely. Like store-bought yogurt, homemade yogurt can be kept in the refrigerator for about a week. Note: For a thicker consistency, like Greek yogurt, once the yogurt has set and cooled in the refrigerator for at least 6 hours, drape a thin cotton napkin or kitchen towel in a colander with a bowl under it to catch the whey. Spoon in the desired amount of yogurt and set in the refrigerator to drain for at least 5 to 6 hours or until you get the consistency you like. Indians prefer chicken skinned but left on the bone for many dishes: curries stew for a while, and the bones help keep the poultry moist. As most chickens in India are smaller than American ones, I often use Cornish hens for my curries; the instructions below work for these smaller birds, too. To cut a whole chicken into six or eight pieces (two each of thighs and legs, and two breasts with or without wings attached), start by pressing the thigh backward away from the body to display the joint that connects the thigh to the body. Cut through the joint with a sharp knife; repeat on the other side. Then sever the legs from the thighs by cutting through the cartilage at the joints. Set these pieces aside. Insert the tip of the knife through the cavity of the breast and backbone to find the space between the bones; slice through, and pry the backbone away from the breast. Place the whole breast on the cutting board with the exposed bones away from you. Press down on the meat with your left hand, and slice the breast in half, exerting a little pressure on the wishbone. Now you should have two breast halves with the wings attached. If the breast halves are large, you can further cut them into two pieces each, providing for a more uniform size of all the chicken pieces. Cut off the end tip of each wing. You can either leave the wings on or sever them from the breast. (Many do not enjoy the wings; I, however, love them! I skin them and add them to all my chicken dishes.) Save the backbone, wing tips, and wings (if not using), to make chicken stock; it is best to freeze them if not using within a day. To remove the skin from the chicken, grip each piece using paper towels for traction, and peel and cut the skin away from the meat. Dispose of the used paper towels and the skin. 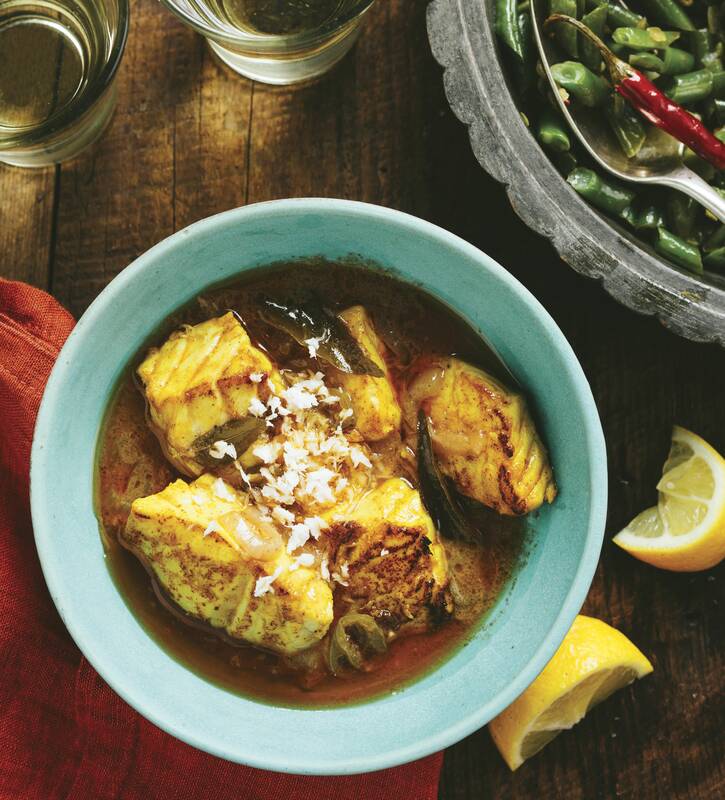 There are many recipes for meen moili, a fish curry from the southern state of Kerala. I got this one from a well-known South Indian chef many years ago, and it has remained my go-to South Indian fish curry. Steamed basmati rice and Green Beans with Mustard Seeds and Onions are perfect accompaniments. If cooked over too high a heat, coconut milk tends to separate, so the benefit of the slow cooker is that it allows you to use coconut milk with ease. Here, simmering the milk with spices results in a luscious sauce. This dish is perfect for entertaining, as you can keep the curry warm in the cooker while adding sautéed pieces of fish, and they will hold without overcooking or falling apart. Shrimp is a great alternative, too. In a bowl, mix the ingredients for the masala paste until combined then set aside. Heat the tablespoon of oil in a skillet over high heat. Add the onions, chiles, ginger, and kari leaves and fry for 2 minutes, until the onions are just soft. Transfer to the slow cooker insert. Add the masala paste and stir in the coconut milk, rinsing each can with 1⁄4 cup of water and adding this to the slow cooker. Cook for 2 1⁄2 hours on low. This curry can be made ahead of time to this point and either kept on the warm setting for up to an hour or cooled and then reheated quickly in a saucepan when you want to continue with the next step. Trim and cut the fish into 2-inch pieces. In a bowl, combine the lemon juice, turmeric, and salt and mix in the fish to coat well. Let stand for 20 minutes. Drain the marinade from the fish. Heat the oil in a skillet over medium-high heat and, working a few pieces at a time so as not to overcrowd the pan, fry the fish for 1 to 2 minutes on each side, until the edges are lightly browned. Transfer the fish with a slotted spoon to a paper towel–lined plate and set aside. Once all the fish is sautéed, carefully transfer the pieces to the hot curry and simmer for another minute or more, depending on the thickness of the fish. Serve hot, garnished with lemon wedges. Note: If using shrimp, allow for five or six size 16⁄20 shrimp per person. Peel and devein the shrimp before using. Sauté the shrimp in a skillet over high heat with 1 tablespoon oil for a few minutes, just until they become opaque, before adding to the curry. Be careful not to overcook them, as they will get rubbery. Variation: For a vegetarian version of this curry, serve with corn on the cob cut into 1 1 ⁄2-inch pieces. Boil the corn until tender, about 3 to 4 minutes, and then add to the curry. Bring the curry to a quick boil and serve. Allow for 2 or 3 pieces of corn per person. Neela Paniz grew up in Bombay, India. After moving to the US, Paniz opened Chutney’s Indian take-out and the hugely successful Bombay Cafe in Los Angeles, and a contemporary Indian restaurant, Neela’s, in Napa. 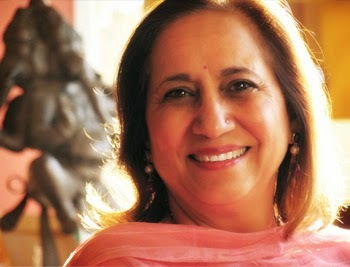 She is also the author of The Bombay Cafe, which put her on the national map as one of the leading voices of contemporary Indian cuisine. Since selling her restaurants, Paniz has appeared as the winning contestant on Chopped, taught cooking classes, provided recipes for many magazine articles, and been a presenter at The Culinary Institute of America. This entry was posted in Eat and tagged chutney, coconut milk, Cornish hen, curry, Eat, fish, Indian, recipe, slow cooker, tomato. Bookmark the permalink.